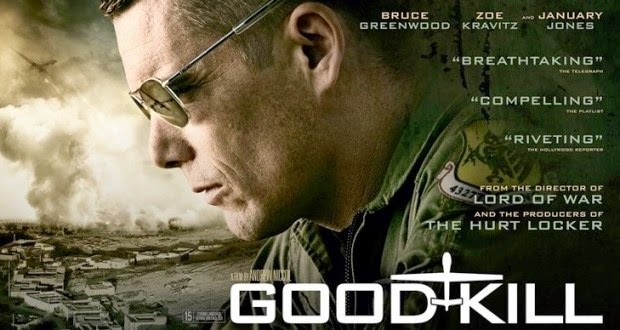 Synopsis: A drone pilot struggles with the morality of war. This review originally ran on CentralTrack.com. In the past, war movies have focused on the front line soldiers who battle to get home, or soldiers who become almost addicted to war and want to stay on tours. However, wars are slowly shifting to be more remote. Instead of boots on the ground and planes in the air, many attacks are now carried out through drone strikes. The film GOOD KILL follows Major Thomas Egan (Hawke), who's a drone pilot stationed in Las Vegas. He has served in six tours over seas as a pilot, but since the military is cutting down on the amount of pilots they're sending, he's been moved back home to kill terrorists from a trailer in the Nevada desert. It's quite a surreal experience. By day he pilots drones and blows up bad guys, and by night, he's home with his wife (Jones) and kids having cook-outs on the weekends. Egan begins to feel unsettled with his current duty. He misses the thrill and danger of flying while on tour, and toys with the idea of requesting for a transfer. To cope with the unsatisfying feeling, he takes a swig of vodka in his bathroom before he steps out the door to go to work. With this uncertainty about his job parallels the uncertainty his wife Molly has about their marriage. Even though he comes home during the evening, he's not really "home". His mind is elsewhere, and it's beginning to take a toll on their marriage. Though it's not explicitly said in the film, you can tell there's probably always been a instability in this marriage. Molly looks exasperated during their conversations, and you can see it in her eyes she's almost to the end of her rope. This film isn't like your normal war movie. There isn't a huge battle the good guys must fight in the end. There isn't really even a typical bad guy in the movie. There's just images of Afghan rebels on video screens who are about to die via drone strike. But this film captures the internal strife many of these pilots must face when operating these missions. Yes, they're taking out bad guys, but what of the collateral damage of bystanders or children who happen to run by at the most inopportune time? There's only so much someone can handle before the killing of the innocents start to affect you. This theme is explored all throughout the film. We've seen films about soldiers who witness war in the battlefront. But looking at war from behind the lenses of the people who are responsible for drone strikes is something movies have never really explored before. It's an interesting study which makes the audience question or at least think about the consequences of using drones in warfare. The actors completely carry the film since the plot is very basic. Hawke and Jones have great chemistry and really feel as if they've been married for years and have struggled with Hawke's issues in the past. Hawke is fantastic as the somber pilot trying to find solace and meaning in his life. You see him try to come to terms with his current position, but his longing for something more dangerous is beating him down. Director and writer Andrew Niccol takes his time developing dynamic characters who have real struggles with the morality of their job. Even side characters are given little arcs which make them feel more real rather than just background pieces. Parts of the film do drag a little, but the characters help keep the movie interesting. There are a few tense scenes when Egan is carrying out a strike, which is impressive considering we just see his target on a video screen. If you're looking for a fast-paced modern war movie, this is not the film for you. But this is a new kind of war film which focuses more on the people behind the scenes and less on the grandeur of action.